There are some mailboxes we don't show here very often. These boxes are repetitive (lots of people have them) or just not very interesting (a plain mailbox painted red isn't creative). Here are some other types of boxes we don't post often — and a list of posts that do show those mailboxes. Mailboxes that I (eventually) figure out are mass-produced, even if they're (probably) handmade — for instance, the two boxes at the left above (from 4228 & 4156 East Paseo Dorado) and the one at the right (which I found later at 4027 E. Santa Barbara). 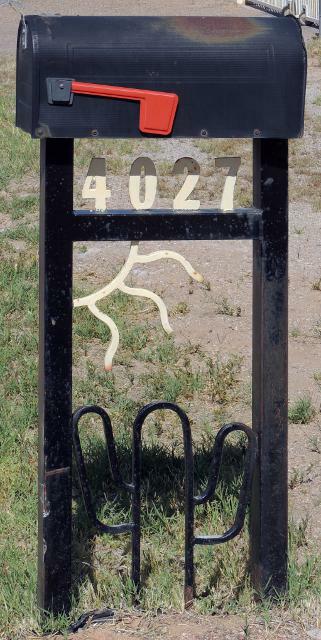 Plain mailboxes with a flag in the shape of a desert animal, like a lizard or gecko (these flags seem to be mass-produced). Here's an exception: 3322 East 24th Street (there's a frog underneath). Saguaro-shaped posts (unless they're really different). Here are three exceptions: 3312 East 23rd Street, 2819 East Geneva Place and Saguaro You Today?. Mailboxes with artistic-looking covers glued on — as in 3013 East Eastland Street (not our kind of mailbox) and Factory-made covers? 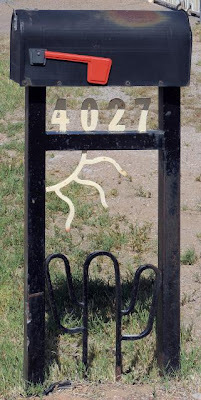 No(t many)..
Mailboxes mounted on augers (like 2313 East 17th Street and 1608 South Treat Avenue). 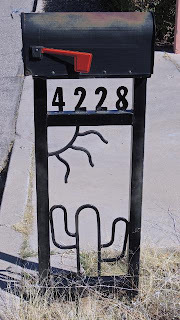 Mailboxes mounted on camshafts or crankshafts (such as 2327 South Tucson Stravenue and 2202 South Hemlock Stravenue). Mailboxes with plants on top (or the side, or the bottom) — for instance, 4012 East Cooper Street and Flowers for Easter. Mailboxes on glued-together piles of rocks. I can hardly resist a punny “(whatever) rocks”… but enough already! You can see the four at This mailbox rocks: 2811 East Geneva Place, Another box that rocks: 2209 North Tucson Boulevard, Highland Free School Rocks!, and (last) Being kind rocks (but...): 6046 East 14th Street. Rock on. I'm learning as I go! I'll add to this list as I find more multiplicative mailboxes.